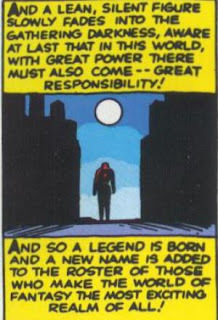 All of which is a preamble to say that, as much as the concerns of Jack Kirby, Steve Ditko, and plenty of others through the years regarding what role Stan Lee did and didn't play in the birthing of one of the greatest sets of intellectual properties of all time are valid (and worthy of discussion), it's also important not to undersell just how integral Stan Lee was to the creation of the Marvel Universe. Characters like Spider-Man, the Hulk and the X-Men may very well have come into being without him, but they would not be the characters we know and love today. While the exact nature of Stan's involvement in crafting specific stories is very much debatable, his role in selling the idea of Marvel Comics - the ideal of the company, its colorful bullpen, the "world outside your window" setting - is not. Moreover, Stan didn't just lend a hand in the creation of specific, iconic characters. He changed, directly or indirectly, superhero comics everywhere. He brought a looser, more natural vernacular to comics. He plumbed character psychoses and personalities for story ideas & pathos alike. He fully embraced the structural, creative & sales potential of the shared universe concept. He challenged the Comics Code Authority, helping pave the way for looser restrictions and more creative freedom across the medium. He made comics cool and hip, and just a little bit more grown-up (without slipping into self-serious "trying to seem more adult but instead just coming across more childish" rhythms. And he never stopped trying to bring the characters he'd had a hand in creating to bigger and bigger audiences through TV and film adaptations. He showed us that kids could be heroes in their own right, not just sidekicks. That gods could have feet of clay. That teammates could be a family, and that families didn't always have to get along. He taught us that monsters could be heroes. And that with great power comes great responsibility. My first encounter with Stan Lee came via his narration for the Spider-Man and His Amazing Friends animated series. Long before I ever picked up a comic book (let alone a Marvel comic book), Stan's unique brand of knowing hucksterism was familiar to me. I knew him from the trading card pictured above which declared him to be "Mr. Marvel". When I finally got around to reading actual comic books, his name was at the top of the masthead on every issue, "presenting" all my favorite tales. Reading Origins of Marvel Comics and Les Daniel's Marvel: Five Fabulous Decades of The World's Greatest Comics (both checked out - repeatedly - from my local library), I learned more about Stan's role in the creation of the Marvel Universe, of so many of the characters and their exploits with whom I'd already fallen in love. By the time Mallrats rolled around, I was in-the-know enough to know, in that too-cool-for-school arrogance in which all teenagers know something, that Stan's appearance in that film was a (understandably) shameless cameo that grossly over-simplified the role he played in crafting all the characters Brody (and I) loved. 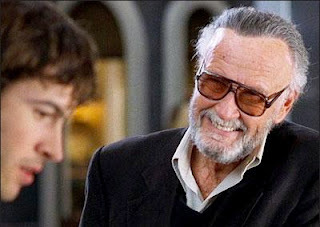 Nevertheless, it was hard not to love ol' Stan, even as his brief appearances in the burgeoning Marvel films started to pile up and become more and more obligatory, his much-loved persona slipping dangerously close to caricature, and more and more details came out regarding just how much he oversold, through the years, his role in creating the characters that were now making movie studios millions upon millions of dollars every year. 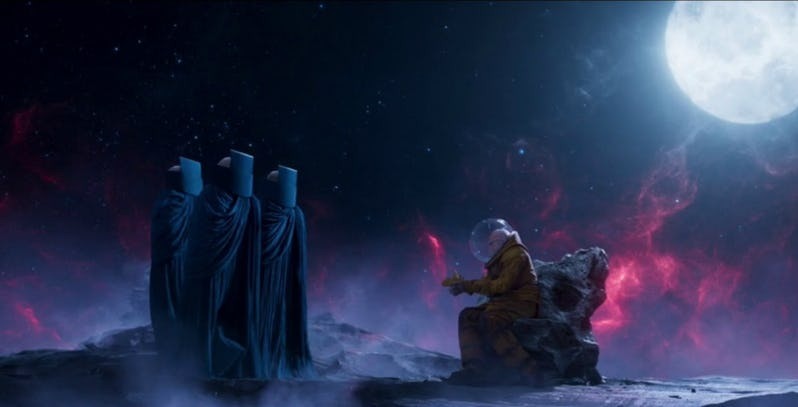 Because no matter what, Stan was there, at the start of the Marvel Universe, and without him, it would look a very different universe indeed, if it even still existed at all. And there's no doubt my own personal universe would be very different if not for Stan Lee and the characters he helped shepherd to life. Without a doubt, he's earned a spot on my personal Mount Rushmore of creators who have significantly impacted my life. That you're reading this at all, on a website where I've reviewed a thousand-ish comics (and counting!) is because, in no small part, of Stan Lee. It's been a long time since Stan crafted any new tales, but the work he did was enough to fill several lifetimes. I am a better person because of his work, and the world a better place for it. That our heroes act more like us, and we in turn more like our heroes, is because of Stan. Excellent eulogy. My first exposure to Stan was through SPIDER-MAN AND HIS AMAZING friends as well, along with other Marvel productions of that era, such as the INCREDIBLE HULK cartoon and "Pryde of the X-Men". I also had this book, THE BEST OF SPIDER-MAN, which was publishes in 1986 and collected several story arcs from the first few years of the newspaper strip, and which included a lengthy introduction by Stan called "Spidey and Me". That, I think, was my first look at Stan as anything beyond a cartoon narrator. I told my wife the day he died that in a weird way, I felt like I'd lost a grandparent. I'm sure his conversational writing style was a large part of that. Even when he addressed something to a plural noun ("Hi, heroes! "), the tone of what followed read like he was writing something just for you. He was a part of my life, in his own way, since practically before I could read -- and that trading card above isn't wrong. Regardless of the question of who exactly did what in the creation of Marvel's great characters, Stan was "Mister Marvel" when I was a kid and a teenager. He was the most high-profile Marvel guy in the 80s and 90s. I saw a picture of him a couple days ago which was taken in the 70s or 80s, and it occurred to me that even as he got older, in my mind, that was always the Stan Lee I saw and remembered. I guess because that's what he looked like when I first saw him and the one time I met him. Because of that, even though intellectually I knew he'd be gone soon, what with the loss of his wife and his various recent troubles, I still somehow felt like he was still the Stan of my childhood and that he'd be around forever. There have been countless words written about how Lee & Co changed superhero comics in the early 60s, moving away from DC's wild-yet-somehow-still-staid style of characterization (those 50's Batman books often feel like you're on a roller coaster, but with the most boring person in the world.) Many of those discussions mention how Marvel's characters were much more realistic, while DC was busy with isolated, too-powerful gods. But Marvel had plenty of gods in its stable, from Thor to Galactus and beyond, so that comparison never really fit well for me. What Lee and his collaborators at Marvel knew that DC didn't (at least not in the early 60s) was that the gods of mythology were as fragile in their hearts as any mortal. I use to have an old paperback encyclopedia of Greek/Roman myths, and a blurb on the back cover said that true mythology was about "heroes who performed godlike deeds, and gods who acted all too human." I don't think there's a better explanation of what Stan Lee brought to his books. 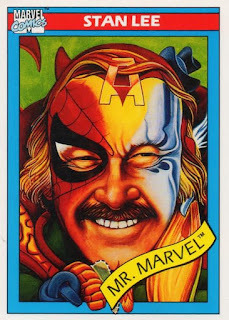 I am old enough to remember that piece of artwork of Stan Lee, which wound up as a trading card, to have been the cover of FOOM Magazine, Marvel's in house quarterly magazine about their comics line, so if there's any better way to get across the amount of time that Lee was an influence on the industry, it's that, because that was a near twenty year period between magazine cover and trading card. Then you throw in the cover of the magazine came thirty years into his career, and the trading card came with two-plus decades left in his life, and you REALLY get how important Stan Lee was. I'll legislate the battles over who really did what in the stories on another day. Stan Lee had an effect on comic books and superheroes, as a creator, editor, and salesman, from the 1940s to almost 2020. For that alone, he deserves respect.